Goal of Investment: to make a return on capital commensurate with your risk appetite. Underlying Principle: the higher the risk of the underlying asset, the higher the rate of return. Thus, US treasuries (zero-risk) serve as the baseline of investment returns. Risk can be systemic (i.e. market crash), sector/industry-based (i.e. commodities) or individual (i.e. a single tech company rockets off, or goes out of business). Risk Profiles: depending on your risk appetite, you should have different investment strategies. Your risk appetite should be informed by your financial goals. High Risk Appetite: people with high risk appetites are not relying on their investments anytime soon. People in this profile may invest in individual securities, ETF's, emerging market funds, currency markets, real estate speculation, or other highly volatile assets. Medium Risk Appetite: people with imminent financial goals (i.e. they want to buy a house in 5 years, or have kids to send to college in 10 years). People in this profile may invest in the overall Index, low-volatility mutual funds, and the such. Obviously, you can have multiple risk appetites for different compartments of your life. Most people will put day-to-day money in a savings or checking account, save for a certain imminent purchase using lower-risk investments, and perhaps be more aggressive with any excess capital left over and chase higher returns. Given the demographic of DLP, most of us will have a fair high risk appetite. While there are many other investment vehicles (i.e. real estate speculation, currency markets, etc.) I'm only going to talk about stock market strategies here. 1. Buy-and-hold the Index: in this strategy, you invest in the Market Index because (over time) it tends to go up. Burton Malkiel is a huge proponent of this strategy. The basic philosophy is that, yes, there will be booms and bubbles over time. But these booms are bubbles occur randomly, and can't be predicted. Instead of trying to divine which way the market will go today, Malkiel argues that you're better off just buying index funds and putting it out of mind. He points out that most professionally managed funds don't beat the market anyways (and those that do can easily be statistical flukes). As an individual investor, if your goal is to maximize wealth in the long run, then just put your money in the market and let it grow over the decades. 2. Fundamental Analysis: in this strategy, you invest in securities and sectors that are undervalued. Buy low, sell high. The basic philosophy is that the market is not always efficient, and that sometimes, solid companies don't get the valuation they deserve (or vice versa, some stocks may be over-bought). However, over time, the market inefficiency will correct itself. Therefore, you should focus your effort on extensive research to identify companies that are undervalued, but have great fundamentals. You then buy their stock at a cheap price and wait for it to appreciate as the market catches up with your insight. Warren Buffet is the most famous and successful executor of this strategy. He buys solid companies with good brands (i.e. Coca Cola) that are undervalued and holds them long term. 3. Animals Spirits: in this strategy, you ride the wave of investor sentiment, buying stocks that are in an uptrend and shorting stocks that are in a downtrend. The basic philosophy is that investors are irrational, and that since the Market is simply an aggregate of lots of irrational activity, fundamental analysis is unreliable. More often, volatility is the response of investors overreacting to news or jumping on a bandwagon. After all, the price of a stock is simple supply vs. demand. If a stock gets a lot of positive press, and more investors know about it, it will enjoy a happy upswing and steady growth. On the flip side, negative press can destroy a stock (classic example: Apple stock (AAPL) showed phenomenal irrational growth, but then plummeted when it lost favor after the death of Steve Jobs). As an investor, you should buy stocks as they come into favor and short them when they fall out of grace, thus making money on anticipating volatility. The key to success is to avoid being the biggest fool at the end of the Ponzi scheme, with the hot potato in your hand. 4. Technical Analysis: in this strategy, you analyze charts because the patterns made by the ticker marks will tell you which direction a stock is going. The basic philosophy is that the market is ultimately efficient. There is no use wasting your time researching company fundamentals, or closely reading the news to predict market trends. Everything that is relevant is already priced into the stock, and can be gleaned by studying the ups and downs. Stocks that tumble follow a ‘falling knife’ pattern. Stocks that are about to take off will have a ‘double bottom’ pattern. As an individual investor, you will never have the inside information or resources to successful pull off fundamental analysis or animal spirits investing. But the big boys (hedge funds, PE shops, Warren Buffets of the world) do and are already taking action. You just need to be able to read the signs and piece it together – all relevant information is in the charts. Hopefully, that's enough to get you all started. To the more experienced investors on this board: feel free to share your personal tips and philosophies. Disclaimer: I am 22 and have very little investment experience. Take everything in this post with a heap of salt. It's a bit risky tossing out one's investment strategy, as there undoubtedly will be people out there saying, "That's a crap way to do it, pilgrim." All strategies should start with goals. Mine are modest: make decent returns over the remainder of my working life, enough that I can retire in a dozen or so years (optimistically), but accept that in return for some surety of asset growth, I am unlikely to ever get seriously rich (which I define as having a net worth in excess of $10M). Of the strategies listed, the first, Buy and Hold (oversimplified a bit in Lindon Eye's otherwise excellent post), is the easiest to employ, takes by far the least effort, holds the fewest "gotchas" come tax-time, and really should be the benchmark against which all other strategies are judged. The reason is that all of the others require that you spend serious time doing research or actively monitoring things, which means time not spent doing other things. This is too steep an opportunity cost for me and I suspect for many on here. I don't want to spend my life watching for heads and shoulders in time series data or getting elbows-deep into the guts of a company to do fundamental analysis. While I respect Mr. Buffett (who wrote a famous essay decrying Malkiel's approach to investing), I also recognize that I'm not him and I prefer not to spend the time trying to invest like him. I'd much prefer sitting down every Saturday morning with my coffee and spend twenty minutes tweaking a portfolio that's mostly on autopilot when the differences between outcomes are likely to be minimal. The preferred way to do Buy and Hold investing is through buying shares in a variety of low- or no-load, low-expense-ratio index funds, which exist in many forms now largely as a result of Malkiel's influential book: total U.S. stock market index, various international and sector stock market indices, emerging markets, bonds, REIT (real estate investment trust), etc. and you can tailor volatility to your needs (stock-based mutual funds are more volatile than bond-based ones, e.g., and have higher returns over the long haul, though higher chances of large declines as well). You sacrifice liquidity when you invest in index funds as the funds don't permit "day trading" and there's a fixed time of a few months before you can pull your money back out of the fund. This is the kind of investing where you don't do that anyway. Instead, one simply buys and reinvests returns back into the fund, a form of compound interest. At my stage in life, I'm no longer "all in" in high volatility investments, as I don't have decades to recover from the next crash. I dominantly mix and match between stock based funds, bond-based ones, and REIT-based ones. I no longer play the options and futures markets, as I don't have the need to goose volatility as I once did (though this is an option for those starting out who can accommodate even more volatility than stock indices). I only invest in passively managed index funds with very low expense ratios, following the maxim that, "In investing, you get what you don't pay for." Index funds outperform 2/3 of actively managed funds and those who beat them don't beat them consistently. I continually tweak and rebalance my portfolio to reflect the level of exposure to risk that I'm comfortable with; this has the side effect over time of selling some assets when they are high and buying others when low, which seems to have worked out to an additional 0.4% annual ROI since I started investing. I also invest a modest amount regularly, called "dollar cost averaging," meaning that while I'm sometimes buying high, other times I'm buying low and I get more for my money when buying low than I lose buying high. Again, over the long haul, this is advantageous, lowering volatility measurably while at the same time increasing ROI by about 0.5% annually. My biggest lack of understanding in this area is less the choosing of stocks and more the actual nitty gritty mechanics of investing: how do you go from having cash in your bank account to owning a stock? And then selling it again, quickly? I mean, I know my bank has an investment service where you can buy stocks through the bank - either with an adviser choosing for you, based on your risk preferences, or choosing the stocks personally - but that has always struck me as the kind of thing to avoid. I'm sure they take a hefty commission. So, how do you go about trading? What platform do you use? Brokerage and money manager fees can be sizable and are best minimized (in my opinion). For investing, the most economical way to do this is to use an online broker that automates all this for you (much like online banking). Myself, I use the web interface with Vanguard, which lets you create an individual investor account from which you can buy a variety of mutual funds they offer (including index funds). If you prefer, you can do a bit of extra paperwork and set this account up as a brokerage account as well, allowing you to trade stocks, exchange-traded-funds (ETF), bonds, etc. I have my account configured with my bank routing and account numbers to withdraw funds directly from my checking account via wire transfer (for mutual fund purchases) or from a Vanguard money market fund (for stock purchases and the like). Come tax time, they mail out tax forms (in the U.S., 1099-DIV forms) with all the data filled in; alternatively, you can import this information directly into your tax preparation software (though there's a fee and I tend to just key it in directly). I'd recommend 'Interactive Broker'. Much lower commission fees and ideal if you're planning on trading often. They charge a flat fee per stock (something like $2 per thousand stocks) so as long as you're not trading huge volumes, it's much cheaper than other platforms. For my stock market stuff, about 1/3 of my portfolio could conservatively be called "high risk" (FWIW I'm up this year.) This is the money I really don't mind losing and does not feature in my retirement planning. The remaining 2/3rds are parked in US Treasury Bills, and a certificate of deposit (suboptimal but, in my defense, I was a teenager when I made the decision) and a limited partnership with my father. I'm going to transition the lower risk section of my portfolio into rental properties over the next two years. It has a better rate of return and, provided you're not an idiot, it has a comparable risk profile. I can write up a longer post of the pros/cons later this week if there's interest. I use the online service provided by my bank. It's tied to one of my secondary accounts. The brokerage is a % on the total transaction value (0.5% on inter-day, 0.05% on intra-day trades). I mostly do intra-day short-selling (sell high stocks you don't actually own, aiming to buy them back low as trading closes, anticipating that the price will fall). If you didn't know - yup, that's allowed. For example our banking industry had been haemorrhaging recently so the smaller banks made for good targets. My strategy is pretty inefficient since I'm more risk-shy than average, though, but somebody with more time to spend on research could do significantly better. However the risk is exponentially high and you can accrue losses quickly if you aren't careful. I actually invest with short-term goals, since for long-term investment there are better options where I live (India) - real estate being the most prominent. I've occasionally lost some money with that too but the risk profile is far better than a short-term strategy in the stock market, and I've made some exceptional gains. Take it from me: in a country where population is booming, you can't do better than real estate. Slight correction. Intelligent Investor was written by Ben Graham, Buffet's mentor at Columbia. 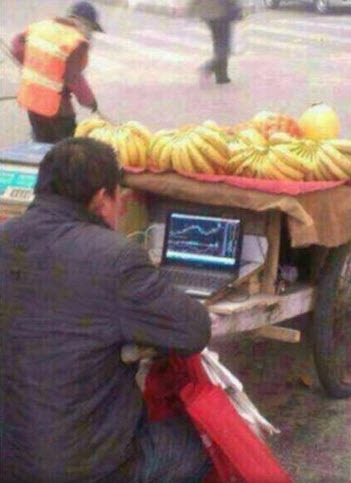 He's one of those value investor dudes. Try One Up on Wall Street. Nice book. Easy to understand. I'm a little too young to invest since I have no capital, but if you're serious about it you should read Anatomy of the Bear. Finally made the plunge into investing, given that ISA interest rates are so abysmal, I can't allow myself to use them any more. Invested what I can for now into Vanguard LifeStrategy Moderate Growth. I'm in for the long haul, as I'm pretty young. There's really no need for me to ever check the current prices of my investment, as I'm not planning to sell for many, many years. And yet, I'm checking every day. I suppose it's harmless, but I find it a bit odd. I'm making my way through A Random Walk Down Wall Street, enjoying the read and the ripping on various sections of investment wisdom. I feel I may have just jumped into investing without thinking and researching enough, but I'm not sure that I'd make a different decision, as I'm probably just gonna go passive regardless, and at that point, assuming a mild amount of risk in a low fee fund, I don't think it'll make a large difference where to go from there. So, how are people's investments going on this fine day? I feel like people knew a correction was coming. I mean the market's been basically flat for six months after five or six years of pretty stellar growth. Now's the time to use up that cash position. The crazy thing is that we've had like a month's worth of volatility in the last week and a half. So we're going to see some pretty heavy swings in both directions for a while. Which could mean getting in on some great deals (there was a point yesterday where if you bought Netflix (NFLX) you could have made like 17-19% on a single day's trade. And there are some cheap stocks right now. Disney's at 95-96, with a stellar quarter coming up. Apple's at 103. Dividend yields are way up. So it's a huge opportunity. Take advantage while you can. The actual effects won't be dramatic anyway. At most, it'll hurt our exportations there a little, and the ECB can insulate themselves from this. Well, if they aren't utterly incompetent. Even then this won't cause a collapse throughout the system. Like, we were in a valuation bubble. People saw it coming. It shows that if you start early enough it's all about waiting it out for a few decades rather than trying to time the shifts up/down in the market. Also on the topic of Betterment, it's great for new people to get into and is incredibly noob-friendly. You deposit the money and pick what kind of a "goal" you want it in, Roth/Traditional IRA, Safety net, general investing, etc and they will invest your money for you as well as give you advice on how much you should be investing to hit your goal amounts. Also, you can still contribute to your Roth IRA under 2015s contributions until April 18th this year. You got 8 days left! You can get a free $20 Amazon Gift Card by signing up to Personal Capital with my referral link and syncing an investment account with >$1,000 (401k's count for this). The platform is similar to Mint, or YNAB. Great for money management, budgeting, and retirement planning. Thinking of investing in SPYD, any opinions? Essentially it talks about how traditional safety net/emergency funds are 100% cash/bonds and suggests that we instead put 40% in equities with a buffer so our safety net also earns a return. Anyway I'm fairly new to DLP but I wanted to post here and offer my advice/opinions on any questions/topics you all might have. I've worked in trading for 4 years and also enjoy learning everything about personal finance (trading and personal finance are completely different, haha). So i'm trying to decided between betterment and wealthfront. Right now i've got a little under 5 grand in investable savings, at about $150 a month. Thats for the next 2 years, after that I suddenly get my income tripled and my expenses doubled with a new job and location. But for right now, I am not certain which will be a better investment. Wealthfront has no cost on the first $15k, which is a line I don't expect to cross in 2 years, even with a high risk investment strategy, but has a higher ETF cost. Betterment has a 2 year cost of about $30, with a lower etf cost (0.18 vs. 0.12 ish), for a net cost difference of about $25. So the financial spread is only about a movie date's worth of money. So which of these two have people used, and which is easier to work with? The most important feature of Betterment for me is that it has no minimum balance. I know that ideally, you would never get under $500 (the limit for Wealthfront), but having the flexibility to withdraw all of your money is nice. I have not used either. I just have some money in some index funds with Vanguard. Have you thought about that? I'm really happy with Vanguard, although admittedly I'm also really happy not spending a lot of time on my investments. So I really haven't spent much time with them besides dealing with taxes and setting up my accounts. But I have not had any problems with them.